Waring House Proprietors, Norah and Christopher Rogers, honoured with Lifetime Achievement Award. 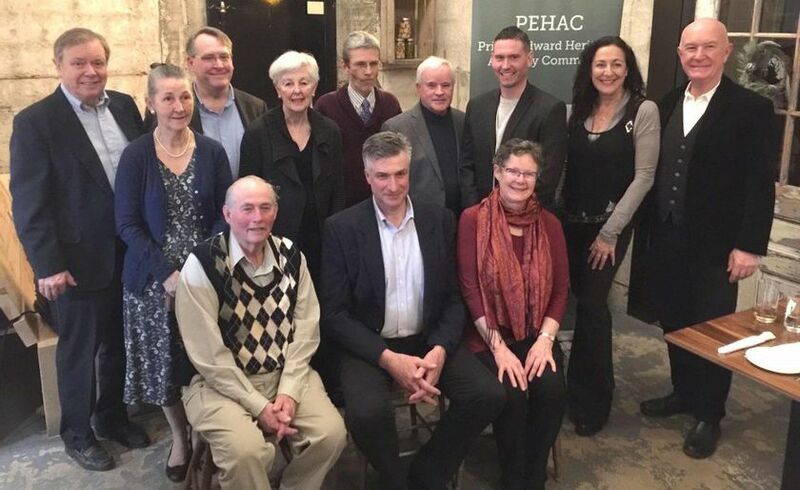 The Prince Edward County Heritage Advisory Committee (PEHAC) capped off Flashback February celebrations by handing out five awards to leading contributors in a ceremony at the Bloomfield Public House. This year’s lifetime achievement award was presented to Norah and Chris Rogers, who have conserved several historic properties in Prince Edward County, while repurposing them as destinations — pioneering the concept heritage properties can drive tourism and community. The couple, physician Norah and veterinarian Chris started their efforts in 1995 with the purchase of the Waring House, an historic farmhouse built by Irish immigrants in the 1860s and converted to a restaurant they frequented. The Rogers reopened the restaurant and spent the following 25 years expanding facilities and adding a pub, inn, and cookery school. Over the years, the Rogers also bought the Picton Harbour Inn in 1997, the former home of the Hepburn family, well-know coal and shipping merchants locally. They also bought 100 Main Street in Picton, an 1835 build they reopened as Loyalist Antiques. In 2001, they bought the Claramount mansion on Picton’s harbour front, but the 1903 building was in a state of disrepair. So, too, were other buildings on the property, like the former coach house. After three years of restoration by over 200 artisans recreating the original architectural details, it reopened as a high-end inn with 10 luxury suites, a spa, and a restaurant. The Rogers have also restored their own Bloomfield home, which was built in 1835. Prior to the lifetime achievement award, they had also received honours from the Loyalist Parkway Association and Prince Edward Builders’ Association. The Rogers have also used their properties for a number of charitable and community building endeavours. Turning to heritage awareness and advocacy, PEHAC bestowed an award on naturalist and longtime Gazette columnist Terry Sprague. The Big Island native developed an early curiosity in nature that shaped his career as a resource technician with the Glenora fisheries station, as an interpreter at Sandbanks Provincial Park, and a naturalist and event co-ordinator through Quinte Conservation and his own Nature Stuff business. His web site, which features a Quinte area bird report brings attracts thousands of hits and he’s educated the community on natural heritage through his columns in the Gazette and elsewhere for over 50 years — more than 6,200 columns in all. Sprague has also given his time generously to organizations like the Friends of Sandbanks Provincial Park, the Prince Edward Field Naturalists and others. Sprague has received numerous awards and honours, including the Richards Education Award from Ontario Nature. In the category for preserving built heritage, South Marysburgh residents Jonathan Kearns and Corrine Spiegel were honoured for their efforts to transform and preserve the historic Ross-McMullen House at the corner of Johnson and Main streets. Now known as Culinary Arts Prince Edward, a culinary-themed private events space, the building served as Royal Canadian Legion Branch 78’s home since the County purchased it from the McMullen family in 1948. With dwindling membership and high utility costs, the branch decided it could no longer maintain the 13,000-square-foot building. Kearns and Spiegel completed their purchase of the property for nearly $1 million in spite of a July 2016 fire. Kearns, the principal architect at Kearns Mancini Architects Inc. of Toronto, oversaw restorations of both the interior and exterior of the building, which he happily showed off at his own wedding to Spiegel in September 2017. A PEHAC release noted the goals for the restoration were to not only breathe new life into a building constructed in 1864, but also to create a hub space to gather communities together. Finally, author and historian Marc Seguin was recognized for his efforts in preserving cultural heritage landscapes. Seguin has been a tireless advocate to protect heritage lighthouses across Canada, including six in the county at Scotch Bonnet, Pt. Traverse, False Duck Island, Pt. Peter, Salmon Point, and Main Duck Island. Seguin, who wrote two books on local maritime history, was a founder of Save Our Lighthouses and a past PEHAC chair. His group’s efforts resulted in 2015 federal heritage designations that preserved the Scotch Bonnet and Pt. Traverse lighthouses. Tracing his roots in Ontario back to 18th Century French settlement near Windsor, Seguin operates a web site www.ontariohistory.ca that details aspects of this province’s past. His work, PEHAC noted, has led him to discover fascinating historical fragments in the areas he lived that have often sparked larger discoveries and projects. On point for Seguin’s work locally is one of his latest books For Want of a Lighthouse: Building the Lighthouses of Eastern Lake Ontario 1824-1914. Mayor Steve Ferguson congratulated all the winners. “The honourees’ passion is commendable. I am continually impressed by the dedication county residents have for preserving and promoting our heritage,” he said in a press release.